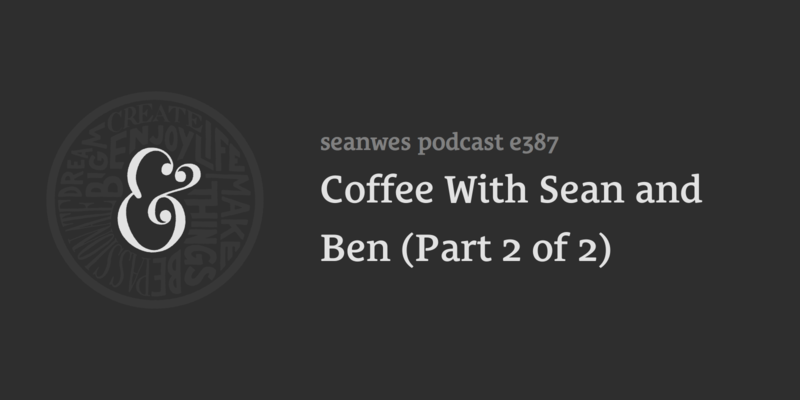 We’re introducing a new show type we might continue doing periodically called, “Coffee With Sean and Ben”. Before we record the podcast, we start streaming a live “Pre Show” to the seanwes members in the Community. It’s a casual and fun segment where we catch up with what’s going on in each other’s lives, share behind the scenes stuff, and have a good time. Coffee With Sean and Ben will be in that same spirit. It’s like a longer, public Pre Show where you can see the kinds of things you miss each week by not tuning in live. With our topical shows, there’s not much time to share what’s going on or what’s on our minds. We’re thinking this format will give us time to share more of what we’re thinking about as well as respond to things like listener feedback (should you send any). In fact, we’re hoping you do send in feedback. We’d love to hear what you think of this occasional show format and if you have any questions you’d like us to answer: https://seanwes.com/contact. Since Ben will be out of town, we decided to record a long episode and break it into two parts. This episode is Part 2 of 2.